There is saltwater coursing through my veins—literally. There is saltwater in all of us. The salinity of our blood is nearly identical to the salinity of the ocean. This may be a biological explanation for why I feel compelled to set sail across thousands of miles of open ocean. When I was 25 years old, I left Florida for Europe alone in a 23-foot sloop named Betelgeuse–eight days after I was married. It was a voyage of high risk and adventure and, remarkably, 34 years later I am still married. My life has been a blessing. Now, work has begun on a new boat, the sailing vessel Flying Fish. It is a 46-foot Island Packet cutter designed for transoceanic passages. 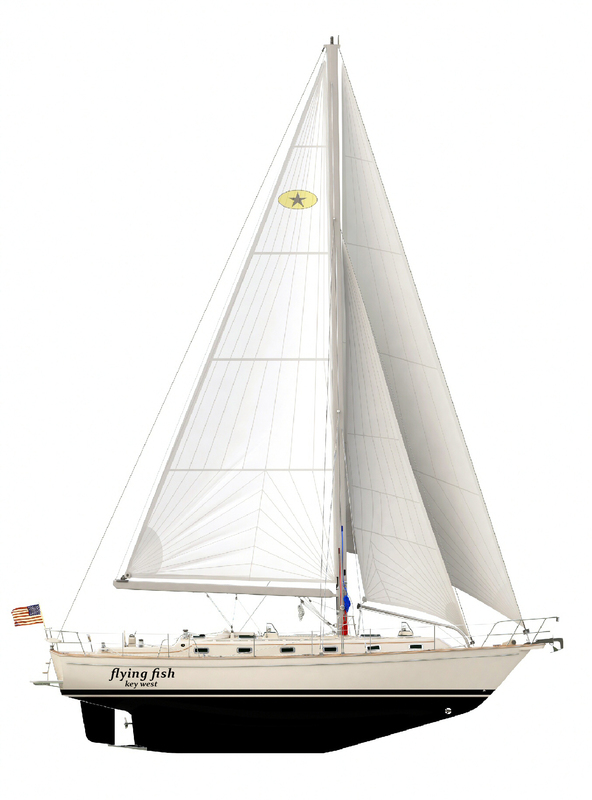 In the next 12 to 18 months, I will raise the halyards on Flying Fish and embark on a new journey across those miles of open ocean. Many of the passages will again be sailed single handed. There will be challenges and discovery. (At age 59, I am no longer bulletproof and this time I will chart my course though different oceans.) It will be voyage of memoir and a reaffirmation of life. Follow the odyssey of Flying Fish in this WordPress blog, or on Facebook, through Twitter feeds and by Instagram as the construction and preparations for this voyage begin. Cape Rēinga at the top of New Zealand is one of the great headlands of Oceania. It was used as a waypoint by the earliest Polynesian sailors, ancestors to Māori, on their voyages of exploration. It is off this point of land that the Tasman Sea to the west and the Pacific Ocean to the east meet in a tumultuous mixing of counter currents and confused seas. And it is this landmass that will be my final view of New Zealand as Flying Fish sails north tomorrow en route to Fiji. Like so much of New Zealand, Cape Rēinga is rich in Māori tradition. According to legend, these turbulent waters are where the male engendered sea, Te Moana Tāpokopoko a Tāwhaki, meets a female body of water called Te Taio Whitirela. Their love affair arouses a dance of whirlpools and currents that initiate the Māori creation of life. But just as there is love and life in the meeting of these seas, there is also a specter of death. For Maori, Cape Rēinga means the leaping-off place of spirits. It is Māori belief that the cape is the point where the spirit of the dead enter the underworld. In mythology, these spirits travel to Cape Rēinga on a final journey to the afterlife, then leap off the headland from the roots of an 800-year-old pōhutukawa tree. That tree exists today. Its roots tenaciously cling to bare rock just above the breaking seas. According to New Zealand’s Department of Conservation, pōhutukawa are known for their brilliant red flowers, but this particular tree–growing out of the rock where the spirit of the dead enter the underworld–has never flowered. Visitors who journey to the cape are asked not to eat, drink, or smoke out of respect for this sacred place. And, it is not only humans who journey to Cape Rēinga. Just below the mystical pōhutukawa tree is Scratching Rock where whales sometimes enter the bay to rub their flanks against dark red rocks formed by undersea volcanic eruptions. Cape Rēinga is said to be the most sacred place in New Zealand. It is a landscape of death and rebirth, a tableau of creation and destruction. As a foreigner I will never understand the full spiritual significance of this place but I will always have a personal connection here. In New Zealand that connection is known as Hawaiki. It is both a mythical location and a template for everything that is good, powerful, and benevolent in the world. Hawaiki is where fullness of life is envisioned and experienced. This helps me to understand a little more clearly why I wander the world in search of places like Cape Rēinga. As I begin this long goodbye to New Zealand I am focused on the ocean passage ahead. Yet, in these final weeks ashore, I am also inexorably drawn back to the terra firma of this lovely country. New Zealand’s ferns are an iconic symbol of this country. To Pākehā (New Zealanders of non-Māori descent), the fern symbolizes a sense of attachment to their homeland. It represents the national identity of this country. The symbol was first used in the 19th Century by New Zealand troops fighting in South Africa and it continued to be used to identify New Zealand units during both world wars and subsequent conflicts. All Commonwealth war graves of fallen New Zealand soldiers have the silver fern engraved on their tombstones. To Māori, the elegant shape of the fronds stands for strength, stubborn resistance, and enduring power. There are hundreds of varieties of ferns in New Zealand. Ferns were used by Māori for their medicinal properties. The mouki and parako were used for skin rash, kiwakiwa was chewed to alleviate a sore mouth or tongue, the root of rahurahu was used to prevent seasickness. The silver frond of the ponga has long been used for marking tracks in the bush, springy leaves of waewaekoukou form a good bush mattress, and stems were used by Māori as a binding twine for making eel traps. The magnificent silver fern is a variety of tree fern found only in New Zealand. It grows to over 10 meters high in the verdant forests on both islands. Māori hunters and warriors used the silver underside of the fern leaves to find their way home. When bent over, the fronds would catch the moonlight and illuminate a path through the forest. According to Māori legend, the silver fern once lived in the sea until the plant with its sacred power entered the forest to help guide the Māori people on their travels. At the navigation station aboard Flying Fish, I have placed a silver fern leaf next to the compass. It is a talisman that I hope will also help guide me on the long journey home. Fiddlehead, the new growth of a New Zealand fern. New Zealand has more than 15,000 kilometers of coastline bordered by the Southern Ocean, the Tasman Sea, and the Pacific Ocean. James Cook mapped the entire coastline. My explorations have been more modest. Flying Fish arrived in the Bay of Islands five months ago. Much of the time here was devoted to refitting and repairs. The tradesmen and services for ocean-going voyagers are excellent in Opua. Once the work was done, I took off my shoes and began wandering the many beachside tracks of the Bay of Islands. These are not the sugar sand beaches of Polynesia shaded by coconut palms. New Zealand is recently born geologically. Evidence of volcanic activity, earthquakes, and geothermal areas can be seen throughout the landscape, especially along the shoreline. The beaches vary dramatically from cold fiords in the South Island to towering hot sand dunes in the north. For the most ambitious walkers the Te Araroa Trail is a 3,000 kilometer route of spectacular New Zealand landscapes featuring beaches and volcanoes, forests and cities. The walking track stretches from Cape Reinga on the North Island to Bluff on the South Island. A person could spend a lifetime walking in New Zealand, but aboard Flying Fish I am beginning to feel the pull of time and tide. Winter is fast approaching. In the coming month as the cyclone season ends in the South Pacific, I will watch for a weather window that will provide safe passage for Flying Fish over the next horizon. Below, a meditative ebb and flow along New Zealand’s Bay of Islands. Add a little volume and enjoy the sound of the shoreline. New Zealand is in mourning. This is a country that has become insulated to the incidents of mass murder that are commonplace in so many other parts of the world. For reasons of isolation, or politics, or simply its tolerance of other human beings, New Zealand is a sanctuary from hate. And then hate appeared in the doorway of a house of worship with a semi-automatic weapon. How does one reckon with such unexpected tragedy? She said New Zealanders were not chosen for this act of terror because they condone racism but rather that they represent diversity, kindness, compassion, and a refuge for those who need it. “And those values, I can assure you, will not and cannot be shaken by this attack,” she said. For those of us who are visitors in this country, especially those of us who come from a nation where mass shootings have become frequent, there is a feeling of profound sadness. In those 15 minutes of sustained gunfire in Christchurch it was as if the innocence of an entire nation had been lost. New Zealanders, however, will respond with typical strength. Christchurch was magnificently rebuilt following the devastating 2011 earthquake. It will recover from this tragedy, too. All of New Zealand will heal again. But on this day, the sky is dark in Aotearoa, the Land of the Long White Cloud. In the cool autumn air of New Zealand’s Northland wine country the Omata Estate Pinot Gris grapes have reached a perfect sugar content of 23° Brix. It is time to harvest. Sailors from the Russell community, and international vagabonds such as the crew of Flying Fish, have been invited to help with the harvest. Considering the amount of wine that sailors consume, this is not hardship duty. At 7:30 AM, Vineyard Manager Sarah Cashmore summons the group of about 18 pickers and dispenses essential tools of the trade–razor sharp cutting shears and a large box of “plasters”, known in America as Band-Aids. “We’ll take a break in a couple of hours for tea and cakes,” she says, “and then a vineyard meal will be served after the harvest.” Our cadre of grape pickers include backpackers and grandparents. We are now all officially Woofers (Willing Workers On Organic Farms), or laborers who are happy to work for their supper. Omata Estate is a small family vineyard producing about 8,000 bottles annually from harvests of Chardonnay, Pinot Gris, and Syrah. The vines are nurtured by the sea breezes off the Bay of Islands and long hours of New Zealand sunshine. Each of the varieties has been planted in carefully selected sites within the vineyard to maximize the individual microclimates. All of the vines are carefully tended by hand and the resulting wines are full-bodied and stunning. The grapes we pick today will be blended to make Omata Estate’s delicious Rosé and Sparkling wines. After the last clusters of Pinot Gris grapes are clipped and put into the harvesting baskets we Woofers amble up to Omata’s outdoor kitchen with its spectacular views overlooking vineyard and bay. Gourmet food including local produce platters, artisanal cheeses, and wood-fired pizza overflow the tables of the outdoor kitchen. Sarah announces that our Pinot Gris harvest is 4.5 metric tonnes, a record for Omata Estate. She then stacks the tables with bottles of the vineyard’s finest vintages. We are happy Woofers and with our nipped fingers taped in bright blue plasters we toast a job well done. With Flying Fish secure at anchor in Te Wahapu Bay near the New Zealand township of Russell, I am feeling especially blessed as a priest in the Anglican Christ Church prints a mark of ashes across my forehead. In this lovely old church, history comes alive from the earliest years of Māori and European contact in the Bay of Islands. Musket holes from the 1845 war between them still mark the exterior of the church. Russell, then called by its original Māori name of Kororāreka, was a rough seaport known as “The Hellhole of the Pacific.” Brothels and grog shops lined the waterfront. Gunshots could be heard across the bay. Missionaries felt that Kororāreka needed a little bit of religion. They purchased land in 1834 from Māori chiefs and agreed that Māori and Europeans should have equal rights of burial. The fundraising subscription list for the church still survives with names of missionaries, settlers, traders, and explorers including Captain Robert Fitzroy and Charles Darwin of H.M.S. Beagle. Legend has it that Kororāreka is named after a soup made from the little blue penguin (Eudyptula minor) which was given to a Māori chief wounded in battle. Feeling better, he was believed to have said, “Ka reka te korora – How sweet is the penguin,” leading to the town’s name. Today, little blue penguins still come ashore after dark on the beach at Russell to nest under the floorboards of waterfront buildings. Among the graves in the churchyard are those of Tamati Waka Nene (a Ngapuhi chief largely responsible for the Māori’s acceptance of the Treaty of Waitangi and peace with the Europeans), Hannah King Letheridge (the second European girl to be born in New Zealand, despite her grave marker stating she was “The First White Woman Born In New Zealand”), and men from H.M.S. Hazard who fell in the battle in 1845. I understand these earthly sentiments of the Anglican Ash Wednesday but my feelings of mortality fall more in line with a verse written on the original oak headstone of the perished seamen from H.M.S. Hazard. Situated on the grounds of Christ Church in Russell, it marks the final resting place of six men who died defending the town formerly known as Kororāreka. According to the ship’s log it is exactly 112 days and 10 hours since the sails of Flying Fish were last filled with wind. Flying Fish has undergone a series of maintenance and repair projects that have kept her lashed to the dock and in the boatyard since her landfall in Opua, New Zealand last October. She needed a little lovin’ after the 10,000-mile passage from Key West. It has been too much time away from the water. Today Flying Fish once again spreads her wings. The tropical cyclone season continues in the South Pacific so for another several months my passages will remain close to the safe harbor of Opua. This week I’ll sail among New Zealand’s Bay of Islands. In 100 square miles there are nearly 150 islands, some with fascinating historical antecedents. Researchers believe large Māori migration canoes journeyed to the Bay of Islands a millennium ago from Hawaiki, the mythical home for the Polynesians dispersing across the Pacific. Captain James Cook landed here in 1769 and while he hunkered down waiting out a series of gales he charted and named the Bay of Islands. It was the first area in New Zealand to be settled by Europeans. The Māori provided the early settlers with and abundance of fresh produce and fish. The Europeans reciprocated with guns, alcohol, and venereal disease. Whalers arrived towards the end of the 18th century, and the first missionaries settled in 1814. The missionaries and whalers did not cohabitate well. By the 1830s the settlement of Kororareka in the Bay of Islands was known as the “Hell Hole of the Pacific.” Dozens of whaleships anchored in the Bay of Islands, many of which had been at sea for over a year. Canoes filled with Māori women, “many naked and covered with fish oil” swarmed the boats to barter their favors for gunpowder and tobacco. Ashore, vagabonds, runaway sailors, and convicts bloodied each other in the crowded grog shops and brothels that lined the waterfront. In 1835 Charles Darwin visited the Bay of Islands in HMS Beagle and left with the opinion that the European residents who had settled here were “the very refuse of society.” He described it as “the land of cannibalism, murder, and all atrocious crimes.” However, according to historian Richard Wolfe, before he departed the Bay of Islands Darwin donated £15 to fund the building of a new church. It was an ironic gesture coming from a man who would go on to publish The Origin of the Species, a treatise that would shake the foundations of Christianity. Eventually, missionaries established a settlement a few kilometers across the bay in Paihia. Church hymns could be heard on the missionary side of the bay while gunshots echoed across the water from the Hell Hole of the Pacific. I drop the anchor of Flying Fish in the lee of Urupukapuka Island. The water is turquoise and crystal clear. New Zealand’s Park Service maintains walking trails across the island that feature stunning panoramic views, beaches, and verdant forests abundant with native vegetation and rare birds. There are also archaeological ruins here, including the remains of author Zane Grey’s fishing camp in Otehei Bay. Grey arrived in 1926 and described the waters off the Bay of Islands as an “Angler’s Eldorado,” rich in billfish and tuna. His son Loren Grey once said that his father fished 300 days a year. I feel as if I am a time traveller as I sail among the the Bay of Islands. The Hell Hole of the Pacific, now named Russell, has been gentrified with chic shops, art galleries, and cafés. Offshore the New Zealand Millennium Cup is underway. Billed as the South Pacific’s premier superyacht regatta it features racing sailboats 160 feet long. The entry fee alone for this race is $5,400. On the ruins of Zane Grey’s fishing camp a group of Japanese tourists with mosquito net hats and bird binoculars chitter about while pop music plays and a server brings them burgers and beer. One year ago today, I departed Key West in my cutter Flying Fish on the first leg of a global circumnavigation. It has been a voyage of self-discovery in a wonderland of raw nature. When I look back at these images of 2018, I see that my camera bias emphasizes the idyllic — downwind sailing, tropical sunsets, vibrant color reefs. These halcyon days are what I record but there have also been moments during this 10,000-mile passage of sheer terror, illness, injury, and loneliness. I prefer to remember the positive. Enjoy these images, and thank you for being here with me. Departure from Key West, December 2, 2017–with 34,000 miles to go. The crew onboard for this leg is my brother Bob and father Robert, both are accomplished ocean sailors. Rounding the west end of Cuba, the bluebird weather quickly turns into the notorious Caribbean “Christmas Winds” with rain squalls approaching gale force in intensity. Still, there is magic in the air. After dark, the sea is alive with phosphorescence. Following one night of squalls Dad finds a flying fish that crash-landed on the deck of Flying Fish. This first passage is a trial by fire–literally. The generator starter motor shorts out and smoke billows from the bilge. The primary navigational electronics fail from the wet weather. Landfall at Panama’s Bocas del Toro is dark and stormy and achieved as if by braille. With a local forecast showing wind increasing to 40 knots, we slip into the Bocas del Toro channel at 2AM with zero visibility in a torrential rainstorm. Flying Fish enters the Panama Canal’s Miraflores Locks with heavy metal close astern. Mast and rigging are a study in geometry under the famed Centennial Bridge as a new ocean opens to the horizon. Las Islas Perlas on Panama’s west coast are a biological and geological treasure. Many sailors eager to cross the ocean will bypass Islas Perlas but Flying Fish lingers for months. I am enchanted by the islands’ flora and fauna, and miles of pristine beaches. Daughter Lilly, a USCG 100-Ton Master Captain, provides the heavy lifting for the 3,500-mile passage from Panama to the Marquesas Islands. These are blissful days of fishing and reading, and on rare occasion, trimming the sails. Tradewinds blow consistently downwind and Flying Fish averages 175 miles per day. Lilly creates healthy and delicious meals with the bountiful fruit and vegetables provisioned from Panama. More challenging for her is trying to establish a routine of yoga, exercise, and French lessons for her stubborn father. Crossing the Equator is a notable event marked by sailors on all ocean passages. Becalmed, Lilly and I celebrate by swimming where the water from the Northern Hemisphere mixes into the Southern Hemisphere. After nearly a month a sea, we find ourselves gazing west, looking for a Polynesian landfall. The sights and sounds and fragrance of French Polynesia are pure exotica. We make landfall at Fatu Hiva in the famed Bay of Virgins. Spectacular monolithic landscapes rise from the sea. Further west, the water clarity is astonishing. Within it are gardens of live coral and a full spectrum of brilliantly colored tropical fish. French Polynesians are generous, beautiful, and they honor their heritage. A young Polynesian girl quietly sings indigenous ballads while she plays a handmade guitar. In the Tuamotos Islands a pearl diver ascends to the surface with her treasure. Continuing the passage west, Flying Fish makes landfall on the islands of Maupihaa, Aitutaki, and Nuie. Humpback whales migrate through the islands on an annual journey north from the Antarctic to find mates and give birth. The land and weather is more rugged here, sculpted by great waves born in the Southern Ocean. This area of the Pacific is known as the Dangerous Middle. Weather is unpredictable and venomous sea snakes emerge when least expected. In the Kingdom of Tonga, Flying Fish anchors in the Port of Refuge. From this base in the Va’vau group of islands there is a sense of sailing in the wake of our predecessors. Capt. James Cook narrowly escaped assassination here. A few years later Fletcher Christian set William Bligh adrift in these waters. Today, Tongans welcome ocean sailors. Markets overflow with fresh produce and Tongan feasts are prepared on the beach. Rocky shorelines provide habitat for octopus and shellfish. The ocean is alive with whales, sharks, and fish. The Kingdom of Tonga is a land of plenty. At high tide nothing visible exists of South Minerva Reef. It lies unseen beneath the surface of the water until the tide begins to recede. Then, rocks emerge from mid ocean forming two perfect natural atolls. The debris of shipwrecks litter the outside edges of the atoll and the sandy bottom inside of the lagoon. The water is crystalline and fish–big fish–abound in this remote patch of ocean. It is the final outpost of Polynesia in the South Pacific. As the year at sea ends, and with the South Pacific Cyclone Season well underway, Flying Fish sails south to the storm-sanctuary port of Opua, New Zealand. The passage in these southern latitudes is formidable. Gales coming out of the Tasman Sea make it difficult to find an open weather window for the sail from Minerva Reef to Opua. A miscalculation (compounded by impatience) results in a punishing five-days at sea. In a lull between squalls, 200 miles from land, a storm-weary European Goldfinch lands on Flying Fish to rest. Despite the Māori name for New Zealand–Aotearoa, land of the long white cloud–landfall here is amid sawtoothed islands under a dark sky. The passage from Key West has been 10,000 miles and nearly a year underway. Both the body and boat are battered. A Māori welcoming ceremony–a pōwhiri–is performed onshore. Kia ora! My mantra for the next five months will be: rest, repair, and rejuvenate. Flying Fish will remain in New Zealand until the South Pacific Cyclone Season ends in May 2019. Then, when the southerly winds are right, I will set sail for Fiji, Vanuatu, New Caledonia, Indonesia, and Malaysia. Please subscribe to FlyingFishSail.com for updates, new images, and essays. The stormy passage from Tonga to New Zealand was a little over 1,000 miles but the southern latitudes tested both Flying Fish and her captain. Flying Fish handled it well. Her captain took a beating. The decision to sail to New Zealand was in many ways a practical one. The South Pacific Cyclone Season begins in about 10 days. Already, there has been one named storm. Tonga, Fiji, Samoa, and other Polynesian island groups are frequently in the cyclone impact zone. My last port of Nuku’alofa, Tonga was ravaged just nine months ago by Tropical Cyclone Gita, a storm that brought 230km winds over the island. It is still difficult to buy a banana or papaya in Nuku’alofa because most of their fruit trees were leveled by wind. New Zealand is out of the South Pacific Cyclone Zone. Flying Fish will spend the cyclone season here. There are some refitting projects necessary on the boat (and her captain) and I am assured by the locals that the weather does get better. It’s springtime here. And by the grace of God, so am I. The first time I heard the song of a humpback whale I was at anchor on a moonless night in the shelter of Eukafa Island in Tonga. I had been sleeping and the sound seemed to emanate from a dream. Then, with open eyes, I realized that the long, sonorous aria was coming from the ocean and resonating through the fiberglass hull of Flying Fish. The sound was longing and lonely and seductive. The life force in this whale song called out: I am here, where are you? Both male and female humpback whales vocalize, but only males produce the complex song of wails, moans, and shrieks that is so identifiable of this species. Humpback songs are repeated in cycles lasting up to 30 minutes and individual whales may sing continuously for more than 24 hours. Each population of humpbacks collectively sings a unique song, one they have learned from other whales. “The traditional explanation for why whales do this is that male whales are singing to seduce female whales, and that females get really turned on by songs that are currently in style,” said cognitive neuroscientist Eduardo Mercado III in a recent edition of LiveScience. To the casual human listener, the love song of a humpback whale sounds magnificently free-flowing and improvised. But fresh mathematical analysis by some bioacousticians has found that there are complex grammatical rules used in whale songs. Using syntax, the whales combine sounds into phrases, which they further weave into hours-long melodies packed with information. Whales have even been found to sing in dialect, according to a study in the Journal of the Acoustical Society of America. Although researchers say that while these songs don’t meet the linguistic rigor necessary for a true language, there is evidence that whales use a hierarchical structure of communication similar to human beings. Most animals use sight and smell to communicate, but these senses are limited in the ocean. Whales rely on sound, which travels four times faster in water than in air. Whale songs are thought to have an important role in mate selection as males sing for attention and to establish dominance. Courtship rituals take place in the warm waters of Tonga and competition for a mate can be fierce. Males sometimes gather into competitive groups around a female and fight for the right to mate with her. Male humpbacks can be seen breaching, tail slapping, and charging during courtship. Ultimately, however, the female calls the shots. Polyandry has been observed in humpback whales, with females known to have multiple male partners throughout their lifespan. Once hunted to the brink of extinction, the humpback whale population fell by an estimated 90% before a 1966 moratorium on killing them went into effect. The population has since rebounded to about 80,000 worldwide. Cultural attention to whale vocalization intensified after a 1970s paper published in Science magazine by biologists Roger Payne and Scott McVay describing “surprisingly beautiful sounds” made by humpback whales. Analyzing underwater recordings they found that these whale sounds were intricately repetitive. “We call the fixed patterns of humpback sounds ‘songs,’” they wrote. Soon thereafter, the hit album Songs of the Humpback Whale was released and the recording went multi-platinum. After hearing my first whale song through the hull of Flying Fish, it was impossible to return to sleep. I went on deck squinting into the darkness hoping to see the whale. I saw nothing move in the calm water. Strangely, I could no longer hear the song, either. It was only when I went below that the song echoed again through the cabin. The area of the hull below the surface of the water functioned as a hydrophone. Somewhere out there a whale was looking for love. Please enter your email address to follow this blog and receive notifications of new posts by email. We will not share your information.